Not only can we holistically reduce your level of pain without any need for drugs, cortisone injections, or invasive surgery, but the team at our Wexford sports injury chiropractic clinic can also help restore your full range of motion and improve your overall body awareness. The human body, especially one that is physically active, cannot move to its maximum potential without well-distributed motion. When we refer to “Body Sense” or “Body Awareness”, we mean a greater ability to feel and listen to signals your body sends you. Your body will signal to your brain when it’s hurt but do you always listen? Your brain will also tell your body what muscles to use, and when to use them, but how often do you call an audible and do what you want? It happens more than you think. People develop poor posture, body positioning, or movement habits. Especially when trying to overcompensate for muscular or joint pain, weakness, and instability. We’ve found that many of the sports injuries we see at our Wexford chiropractor office, particularly joint problems of the ankles or knees, are accompanied by biochemical dysfunction. Muscles go on lock down whenever the initial injury occurs. They do this to become stable and avert further damage. The result of this lockdown is a decreased range of motion that can lead to spasms and even more damage to nearby joints. Generally, the position your joint was in at the time of injury is the position it remains locked in. Needless to say, that’s the wrong position. Misalignment of the joint occurs resulting in biochemical dysfunction even after the pain and discomfort subsides. Notice we didn’t say “After the injury is healed” but rather “After the pain subsides.” Sports injuries never truly heal without proper treatment and rehabilitation. Some people work or play through it. Some people sit out a few days and treat the pain but not the injury. When the pain subsides, they consider themselves to be healed. But the biochemical dysfunction is still present.. Scar tissues and adhesions form. Pain or discomfort elsewhere in the body may manifest that isn’t necessarily linked to the original sports injury. For instance, an inexplicable knee pain may surface several months after an ankle sprain. And there isn’t one consideration that the two are linked. But they are. Listen to your body. Seek treatment and make sure any sports injury is rehabbed properly. 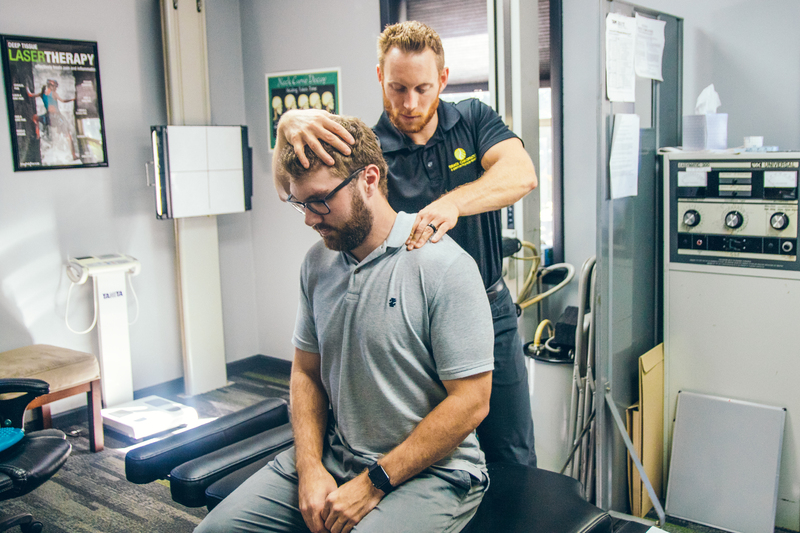 When you come to our Wexford, PA sports injury chiropractor office, we will ensure that soft tissue movement is maintained through a series of rehabilitative motions and exercise. This promotes proper joint alignment, proper functioning, and optimal performance. If you’re in the general Greater Pittsburgh/Western PA region, and need a sports injury chiropractor in Wexford, PA, call us today to schedule an appointment.